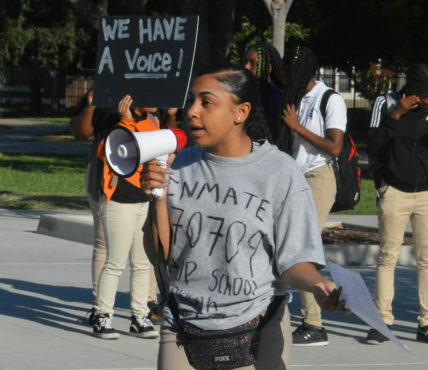 SACRAMENTO — Just when the administrators at Sacramento Charter High School in Oak Park thought that the dust settled behind students walking out of classrooms in three-straight days in protest of school policies, the fourth day of the demonstration was added to the cause. About 8:50 a.m., on Sept. 11, about 70 students exited the school to continue their protest and demands. The good part about the protests is that many of the parents support the students, who negotiated some rule changes at the end of the previous school year. When the students returned for the 2018-2019 school year, most of those rules that were to appear in the student handbook, including a lax in required school uniforms, were dismissed by the administrators of St. Hope Public Schools. Each time the students walk out of class it cost Sac High tremendously. The school cannot get state funding for each student that is not seated at a desk. Young also said the students were upset when certain instructors that they liked did not return to the campus. Smith reportedly had held the position as Sac High’s Site Leader for only two months. Parents have been torn about the campus’s high turnover rate. Keeping educators on the school’s ground has been and issue. As with the students, the parents, especially the ones who have been dealing with St. Hope Public Schools have their say about the treatment they claim their children are experiencing. The protesting students had a support system from members of the community who helped them organize for the walkouts. Berry Accius of Voices of the Youth and Loreen Pryor, president of the Black Youth Leadership Project was on campus for assistance to the students.